Rabat – Morocco “appreciates the particular interest the European Union takes in the profound, comprehensive reforms instituted by HM King Mohammed VI,” Moroccan Foreign Minister said on Tuesday. Taib Fassi Fihri was speaking in a meeting with the EU’s special representative for the region of the south of the Mediterranean, Berbardino Leon, the foreign ministry said in a statement. 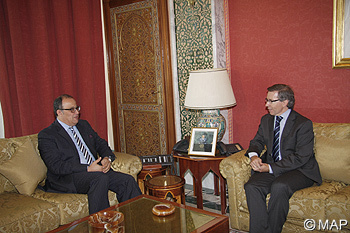 He also expressed Morocco’s appreciation for the European bodies’ strong support for the reform process in the Kingdom. The minister highlighted the importance Morocco attaches to the special bilateral partnership with the EU, within the framework of the advanced status granted by the Union to the Kingdom in 2008. “Morocco hopes this pioneering partnership will get enriched and enhanced to support” the reform process under way in the Kingdom, the minister added. The Kingdom also deems the time has come to set up a new European neighbourliness policy, whose potential is promising, Fassi Fihri said. In this regard, the minister welcomed the G8’s call for Morocco to join the Deauville partnership, which attests to appreciation of reforms launched by the Kingdom.